My name is Dana Lewis and I have a closed loop artificial pancreas (that I built) that I use every night. Also see: woot! We closed the loop in December (click here for more details about the first week of data & basics on how the closed loop works; or here to learn more about the basic non-closed loop #DIYPS and how far we’ve come in a single year), and I’ve been using it almost nonstop since. When I first started looping in December, I originally intended to only use it at night, but it was hard to not loop during the day, too. The idea that I could sit at my desk and work for 3-4 hours straight, and not worry about my BGs, is so appealing! However, it’s not really practical for me to want to use 24/7 every day…yet. This is where the versions of APS that will come to market in 3+ years will be great, because it will be all-in-one (or at least limited in excess pieces you have to carry). To wear it 24/7, I have to have enough batteries to power the raspberry pi and keep it in range, which means constantly picking it up and moving it around, carrying it in my bag from meeting to meeting, etc. I’ve decided it’s not worth it for every day, but it is awesome to have the choice when sitting through an important interview to have it running and have more security and peace of mind. 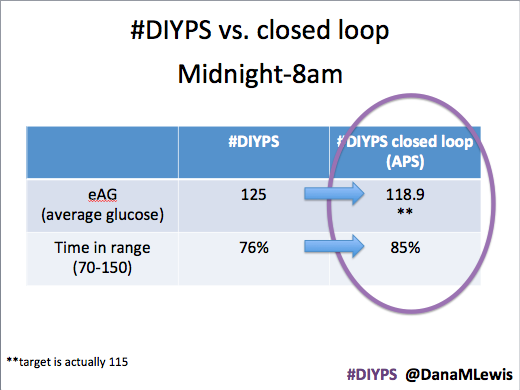 When we first showed our closed loop efforts off, we had about a week’s worth of data that already showed improved overnight blood glucose (eAG) and time in range, plus reduced number of #DIYPS alarms. We also built a 7 day and 30 day view of this closed loop activity history so I can look at trends by hour overnight (versus manually compiling and visualizing them, like I did in our first closed loop data post here). However, when I first started looping overnight in December, I had rises around 2am that the loop had to handle by providing higher temporary basal rates than my scheduled basals. I upped my midnight basal rate as a result, but it looks like I upped it too far since the closed loop often temps low now during that time frame. My next step is to probably change my midnight basal to be lower by 0.1u, and see if that reduces the amount of low temps needed from 12-2am, without causing spikes. My theory is that this alone may also reduce the number of higher temps from 2-4am, because those may be a result of the lower temps earlier on. Thus, I am starting overnight basal tweaking with this one change and seeing how much of a ripple effect it has for the rest of the night as well. In pursuit of…what? Or: what are we optimizing for? My BG averages overnight (and during the day) are excellent (well within the “normal” range <120) and time in range is continuing to grow (85% & counting) with using the closed loop #DIYPS. So, beyond minute basal tweaking, what’s next? At this point, I think the next goal is encouraging other independent researchers to get up and running on their own closed loop overnight APS. Do we really need to wait another 3+ years for APS technology to come to market? What exactly would #WeAreNotWaiting look like if we applied it to closed loop Artificial Pancreas technology research? What do you think?